The Third Doctors final Dalek story. Death to the Daleks cast the monsters in a somewhat more unusual position of making them more vulnerable. The Doctor decides to take Sarah Jane Smith to the planet Florana. Along the way however the TARDIS becomes stranded on a desert planet where the TARDIS is drained of power. The Doctor meanwhile is saved by a group of humans who take him back to their ship. They tell him that there is a space plague sweeping the galaxy that is killing millions. The only known cure for it is parranium, which though rare around the rest of the universe, is as common as sand on this planet, Exxilon. Sadly however when the humans ship arrived it was drained of all power too just like the TARDIS. The natives, the Exxilons are savage degenerates who worship the city. Having already killed some of the crew, the humans mission looks set to be a dismal failure. Just then a second craft arrives on the planet. Thinking its a rescue ship the humans and the Doctor go to investigate. Unfortunately they soon discover that it is the Daleks! The Daleks order that the Doctor and the humans be exterminated, but when they try to fire it is revealed that they are also affected by the same power drain, with their weapons being totally useless. The Daleks and the humans regrettably form an alliance with one another. The Daleks lie to the Doctor and the humans that the same space plague is affecting them and that they are dying in millions. In truth however the Daleks simply want to steal the parranium, destroy the surface of Exxilon to prevent anyone else from getting it, and then use it to hold humanity and the other species that are suffering to ransom. Along the way to the mining dome, the Daleks and the humans are attacked by a horde of Exxilons who kill one of the human party and one Dalek, by beating it to death. All including the Doctor are captured. When the Doctor comes across the Exxilons torturing Sarah using their poison, the Doctor attacks their high priest, and he is sentenced to death as well. The leader of the Daleks meanwhile tries to bargain with the leader of the Exxilons for the Dalek and human party’s (but obviously not the Doctor and Sarah’s) freedom. Back on their ship however the Daleks are able to replace their dead ray guns with machine guns which prove effective against the Exxilons. These Daleks slaughter their way through the Exxilons and round them (alongside their former human allies) up in labour camps to mine the parranium. 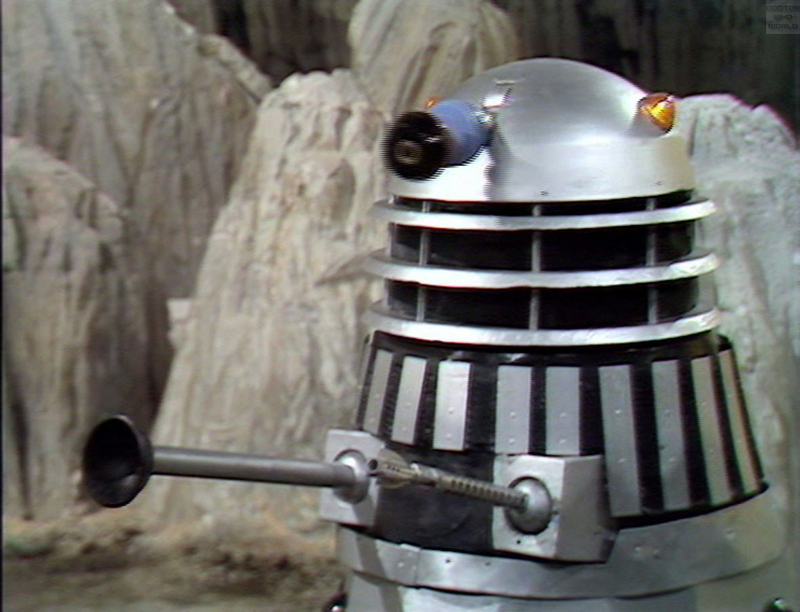 The Daleks also attempt to exterminate the Doctor and Sarah, who escape through the cave system in the commotion. The Doctor and Sarah encounter a renegade group of Exxilons led by a man named Bellal. Sadly their time came when they constructed a gigantic, sentient city. The city eventually turned on the Exxilons and nearly wiped their race out. The survivors split into two factions. One who worship the city as a god, and the other, Bellals group who want to destroy the city. 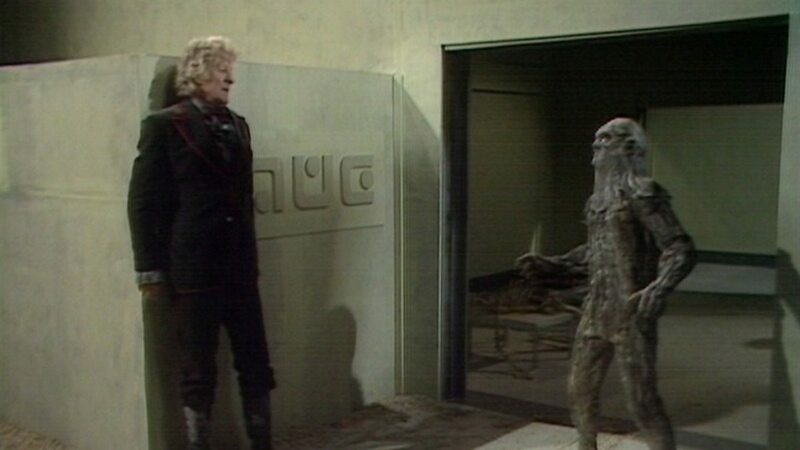 The Doctor agrees to help Bellal make his way through the city to destroy its brain. The Daleks meanwhile have also realised that the city is the source of the power drain and so they not only send two humans to destroy the beacon, but two Daleks into the city as well. The Doctor and Bellal make their way through the city’s traps and puzzles with the two Daleks behind them. Along the way they find the corpses of previous Exxilons who failed the tests. Sarah meanwhile along with a member of the human crew, Jill Tarrant is able to get the parranium off of the Daleks ship and onto the humans one, replacing the Daleks parranium with bags of sand. The Doctor and Bellal make their way to the city’s brain. As the Doctor attempts to scramble it, the city creates two zombies to attack them. The zombies however are distracted when the two Daleks show up. The Daleks machine guns have no effect on the zombies who beat the Daleks whilst the Doctor and Bellal escape. The Daleks bomb destroys the beacon and power is restored. Now at full strength, the Daleks reveal their true plans and state that they will launch a plague missile on Exxilon, rendering further landings on the planet impossible. As they take off however, one of the humans named Galloway uses the Daleks own bomb to destroy their ship. The Doctor tells the two surviving humans that they need to get the parranium back to the colonies. As they prepare to leave however they notice the city of the Exxilons, as a result of the Doctors actions, dying. As it crumbles to pieces the city actually screams. Though the Exxilons are now free to rebuild their planet, the Doctor remarks that the City of the Exxilons was one of the 700 wonders of the universe, and that its a pity that now the universe only has 699 wonders. Death to the Daleks has always been one of my favourite stories. It demonstrates all of the strengths of Terry Nation as a writer. We have a planet with a rich and detailed history, non stop action, morally grey characters, and wonderful, scary monsters. Though its true that there are some of his old tropes here, such as a long dead city, and space plagues, its not done in a way that negatively impacts the story. First and foremost I think Death to the Daleks is often overlooked (by everyone except for Nicholas Briggs) for the interesting way it portrays the Daleks. In the previous Pertwee Dalek stories the monsters were not only portrayed as incredibly powerful, but also in a position of control too. Here we see them unable to even defend themselves, and be forced to rely solely on their wits. Even when they do manage to replace their guns, then they are still vulnerable. as many of the monsters on Exillon are immune to bullets, such as the giant mechanical root that tears several Daleks to bits, and the zombies in the city that beat them to within an inch of their lives. Whilst some critics have argued that this makes the Daleks seem weak, I don’t think so. The Daleks are shown to be extremely cunning as a result of the extra problems they have to overcome throughout this story. For instance they are able to fix the power loss, not the humans. They not only construct weapons that are effective, but they are also able to pinpoint the source of the power drain and destroy it too. Furthermore having the Daleks overcome all of the tests in the city reinforced to me at least how they are the Doctors equals in intelligence too, as the Doctor had been the only person that had managed to overcome them before. The Daleks also manage to successfully dupe everyone about their real intentions until the end of the story too. Furthermore I like the way that the Daleks overall plan is not just a direct invasion. Its a very sneaky, underhand plan to steal the only cure for a lethal plague that is affecting the humans. We haven’t seen the Daleks be portrayed as this manipulative and cunning since Power of the Daleks when the monsters were similarly put in a vulnerable position. In Power however they arguably had a bigger advantage as no one save the Doctor knew who they were. Here however they are dealing with a group of humans who know exactly what they are capable of (including one who at first refuses to work with them after his father was killed by in the last Dalek war.) Furthermore the Exxilons are savages who want to kill them regardless, and so the Daleks are pushed to even greater extremes, but they still manage to overcome them. Galloway, a member of the human crew takes up the position of the devious humanoid character that the Daleks work with in this adventure. Galloway’s a very interesting character overall. At first he just seems like a ruthless glory seeker. He has no regard for the safety of other members of the party, including the Doctor and Sarah, and worst of all is show to be willing to help murder innocent lives if it means he can get the parranium back to earth. His crew mates don’t trust him at the best of times, including even their former commander who insists on his death bed that Galloway is not fit for command. This coupled with the fact that he seems to work better with the Daleks make him seem like a villain, but ironically he ends up as the hero of the piece when he blows the Daleks (and himself) up just as they are about to launch their plague missile. Galloway was just practical and devoted to his duty to get the parranium back to earth that he seemed ruthless to those around him. He viewed everyone’s lives as expendable, including his own for the greater good, and whilst that did lead him to do shady deals with the Daleks, ultimately he put his money where his mouth was and sacrificed himself to destroy the Daleks and saved countless lives in the process. In a way Galloway is kind of like a precursor to Avon from Terry Nation’s later series Blake’s 7. Avon similarly could come across as a villain at times. He was not above hitting women, shooting people in the back, or even attempting to murder his friends like Vila. However his actor Paul Darrow never saw him as evil per se, more just practical to such a degree that he could appear as ruthless, and a lot of the time Avon often saved the day just like Galloway in spite of, or perhaps because of his ruthless actions. Sadly aside from Galloway the rest of the human characters are a bit wet or bland. Still the Exxilons fortunately are fantastic creations. Once again Terry Nation gives them a great detailed backstory, and fills their world full of strange creatures from the city to the mysterious giant hostile roots that live in the waters and caves of the planet. The design for the Exxilons and their voices are creepy too, particularly when they first capture Sarah. The city itself meanwhile is a very interesting concept and the sets are magnificent. I was always scared as a boy at the way the previous Exxilons who had tried to make their way through the city’s corpses were just left to rot in there. Imagine being one of the Exxilons who failed the first intelligence test and seeing the corpses of all the others around you, knowing that you’d just be left to rot in here forever. There’s a really effective moment when the Doctor and Bellal make their way to the centre of the city, and the Exxilon who was previously seemingly in control and monitoring their tests melts into nothing. As soon as the Doctor and Bellal arrive, then it has no further use for him and he just is disposed of. Had it not been ironically for the Daleks timely intervention, then the Doctor and Bellal would have been suffered the same fate. The final sequence where the city screams as it dies is also very memorable too. The only problem with the city is that the traps are a bit too simplistic and easy. Its hard to believe that so many great minds could have been stumped by them. Aside from Galloway, the other standout supporting character in this adventure is Bellal. Bellal is an extremely lovable character. He has a somewhat child like quality to him, such as when he hugs Sarah in fear of the Dalek, yet at the same time he is also smart enough to be of use to the Doctor in the city, and a brave character when it matters, who is fighting to save his people. His design is also brilliant. The shinning effect on his skin is very striking, whilst the mask allows the actor more flexibility in his performance at the same time too. Many fans have said that Bellal should have become a companion and I do think he would have been a fantastic addition to the TARDIS, though the actor who played him, Arnold Yarrow might have had a hard time always dressing in that uncomfortable make up! The only real faults I have with Death to the Daleks are very minor. Some of the production values are a bit weak, such as the root, which you can see is held up with string. Also some of the incidental music is quite grating. Some of its very good, such as the music when the Sarah first stumbles upon the city, and when the city is dying. However I would agree that the notorious jazz tune that follows the Daleks everywhere they go is terrible and inappropriate for the monsters. Still other than these minor quibbles, Death to the Daleks is an imaginative, action packed, exciting story that uses the Daleks in a unique and interesting way. This story was originally called The Exxilons. Its name was changed to Death to the Daleks at the behest of Robert Holmes who hated the Daleks. It was during the filming of this story that Jon Pertwee decided that he would leave the role of the Doctor after 5 years. The Daleks colour scheme was changed back to white for this story as the director felt they looked more menacing that way. It would ultimately be changed back to grey after this story, though white Daleks would be featured alongside Grey Daleks in Revelation and Remembrance of the Daleks. Nicholas Briggs, the voice of the Daleks in the revival has regularly cited this story as one of his favourites, and has mentioned it as being a big influence on much of his work with Big Finish.